From early in its history Junior League members have occupied positions of influence. And, many have served—and continue to serve—in elected and appointed government positions on all levels. In 1933 President Roosevelt named Mary Harriman Rumsey, founder of The Junior League, to chair the Consumer Advisory Board of the National Recovery Administration. The first woman elected to Congress from New York State, Ruth Baker Pratt, was a member of the New York Junior League. Representative Isabella Greenway of Arizona belonged to the Phoenix League. Eleanor Roosevelt, the First Lady and most prominent volunteer in the United States, acknowledged her debt to The Junior League, which she said gave her a start-however small-in public service. 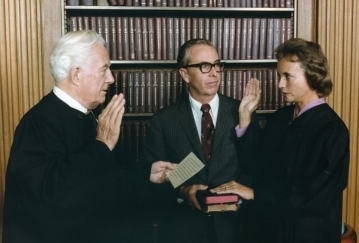 And in 1981, Sandra Day O'Connor, a member of the Junior League of Phoenix, was the first female appointed U.S. Supreme Court Justice. The following is an ever growing list of Junior League members who have served as elected or appointed government officials in federal, state and local capacities. Use the pull-down menu below to read more about them.